The expectations and well-being of mother-to-be. Objectives: To determine pregnant women’s emotional status and expectations with regards to childbirth. Methods: 66 pregnant women who were treated in Siauliai Woman’s and Child Clinic because of different pregnancy pathology participated in a confidential questionnaire survey. Results: Mothers-to-be feel intensive fear of giving birth (66.3 points on a 100-point scale of severity) moderate anxiety (53.9 points) and slight fatigue (39.6 points). Pregnant women are in need of emotional support from family members (76.2 points), experience joy of expecting a child (84.4 points) and have moderate wish to give birth (48.4 points). Pregnant women evaluated their preparation to perform active actions during labor as average (53.6 points). They would like to reduce the fear of giving birth (49.7 points), anxiety (37.2 points) and fatigue (25.3 points). Pregnant women would also like to increase self-confidence (31.4 grade) and readiness for active actions during labor (23.3 points). The results showed that during the later weeks of pregnancy women feel more ready for active actions during labor (r=0.503, p<0.001). Towards the end of a pregnancy the sense of anxiety (r=0.634, p<0.001) as well as the desire of having a baby increases (r=0.370, p<0.05). A significant difference regarding psychological well-being was observed comparing primiparous and multiparous women: primiparous women feel less tired then multiparous (p<0.05), experience greater joy of expecting a child (p<0.05), but at the same time they are more afraid of giving birth (p<0.001). Nulliparous women desire better preparation for giving birth (p<0.001) comparing to multiparous. Multiparous women would like to receive greater support from family members (p<0.001). Pregnant women may experience many different and often unstable emotions. Researches show that emotional state and depression during pregnancy leads to increased anxiety and depressivity after childbirth [1-3]. Pregnant women’s emotions, experiences and various pregnancy and birth problems are strongly correlated. At pregnancy pathology department women are treated for a variety of somatic complaints. Unfortunately, it is difficult to predict what kind of emotions women are experiencing while expecting a child. Typically, pregnancy and childbirth is associated with positive emotions, but such emotions are not related to each pregnancy. For many women pregnancy and childbirth experiences are stressful life events that require important decisions . The relationship between a pregnant woman’s psychological well-being and fetal well-being is receiving more and more attention. Perinatal Psychology begins taking root in prenatal care institutions. Positive and negative emotions have different effects on fetal behavior during pregnancy and after birth . Increased anxiety, depression and stress levels during pregnancy are associated with the physiological changes experienced during pregnancy . Psychological distress and increased doubts about pregnancy are associated with complicated pregnancies . Social support has positive impact on pregnancy pathologies treatment . Pregnant women, who are treated at pregnancy pathology department express doubts and concerns about their inability to control pregnancy, fear of having a baby and pregnancy fatigue . Women with risk of miscarriage express emotional and unstable behaviour . Doubts about the process of labour negatively influence the psychological well-being and reduce distress coping strategies . The predominant emotions of women with high risk of miscarriage are fear, anxiety and prenatal emotional connection with a child deficiency, depression and loneliness . Genetic testing and various medical procedures can cause stress and anxiety . Rapidly growing number of studies in the literature show a possible link between pregnant women’s emotions and various pathologies of pregnancy as well as the incidence of birth problems [2,6,7]. It has been demonstrated that chronic stress negatively affects fetal development and is related to preterm delivery and complicated pregnancy, especially in the second trimester [2,7]. C Urech studies show undoubted influence of stress on pregnancy . Prenatal stress increases risk of miscarriage, incidence of embryonic and fetal growth disorders and low birth weight [2,8,9]. Furthermore, a link between physiological complications (e.g. high blood pressure, reduced blood flow to the uterus) and emotional stress (e.g. stress, anxiety) during pregnancy was observed [3,10]. Even preeclampsia is associated with changes in stress hormone levels . Good relationship with partner and social support during pregnancy effectively helps to cope with stress predisposing factors, which have an impact on the occurrence of postpartum depression . Depressive symptoms are closely related to pregnancy . Studies show that depression during pregnancy is as common as postpartum depression [12,14]. Woman`s depressed state during pregnancy usually continues after giving birth to a child . In addition, it is linked with preterm delivery, low newborn weight and fetal development retardation from the norm [15,16]. Consequently, pregnancy anxiety and fears of childbirth are important postpartum depression symptoms. Pregnant women, who have high levels of anxiety often, demonstrate health endangering behaviors: smoking, consuming alcohol, avoiding consultations, medical procedures and not trying to reduce anxiety . Severe anxiety can increase stress hormone levels which can reduce blood flow to the uterus, furthermore, immune system dysfunction caused by anxiety increases the risk of preeclampsia. All of this can lead to premature birth . Women who experience more anxiety, often gives birth prematurely, lighter weight and their newborns have increased neonatal morbidity perceived by the Apgar scale . Anxiety strongly influences women's psychological adaptation to pregnancy and infant . R Hart, CA McMahon study showed that anxious mothers have lower maternity competence and emotional attachment to their newborns . Depression and anxiety during pregnancy and postpartum period hinders the formation of secure mother-child communication and increases the risk of developing a cognitive, emotional or behavioral disorder . In addition to anxiety, almost all women feel fatigue during pregnancy . Psychological factors such as anxiety, depression, and dissatisfaction with their bodies and poor physical condition increases fatigue. Due to emotional stress pregnant women feel exhausted and they no longer have the strength to resist unnerving thoughts about the birth process and the possible pain that awaits them. A quarter of all pregnant women experience fear and anxiety anticipating possible pain during labor and are worried because of the unpredictability of the labor process that may result in an emergency caesarean section decision . Fear of giving birth is associated with fatigue, available assistance, stressors and anxiety . Among women who have experienced a lot of stress during labor (e.g. a traumatic labor, unplanned and emergency caesarean surgery) the fear of giving birth can occur with posttraumatic stress disorder symptoms . A strong fear of giving birth can encourage women to request caesarean section operations even in the absence of pregnancy complications . It is important to recognize behavioural and anxiety disorders that increase the risk of postpartum depression in order to improve the overall well-being of pregnant women and reduce the risk of complications during pregnancy. So overall, psychological wellbeing is important because pregnant women’s own subjective assessment for motherhood and anxiety about child birth best represents depressivity during pregnancy. To assess present and desired mood of pregnant women, who were treated at pregnancy pathology department in Woman’s and Child Clinic, of Republican Siauliai Hospital. Additional aims include assessing pregnant women’s feelings and experiences they would prefer to change and clarifying issues on which a psychologists should focus. 66 pregnant women treated at pregnancy pathology department of Siauliai Woman’s and Child Clinic was included in the study. A graphic rating scale-11.8 cm line with one side representing minimal value and the other side representing maximal value - was used. Participants rated the intensity of specific feelings associated with pregnancy (e.g. tiredness) by marking an “X” on the scale. Participants were also asked to mark an “O” sign in the same scale representing the desired intensity of feelings. The distance from the start line (minimal strength of feeling) to the selected present and desired feel-points was measured. Numbers were converted to 100-point system. Results express the strength of the feeling: 0 points is minimum feeling, 100 points is maximum feeling. Data were processed using SPSS Inc., version 17.0 (Chicago, IL, USA). Study revealed, that mothers-to-be feel intensive fear of giving birth (66.3 points), moderate anxiety (53.9 points) and weaker than the average fatigue (39.6 points). Women indicated a desire to reduce the mentioned fear, anxiety and fatigue. Pregnant women are in need of emotional support from family members (76.2 points), experience joy of expecting a child (84.4 values) and have moderate willingness to give birth (48.4 points). Participants did not indicate desire to change the latter feelings. Mothers-to-be evaluated their preparation to perform active actions during labor as average (53.6 points). Moreover, women moderately rely on their own strength (51.9 value), which does not reflect their wishes (Figure 1). Figure 1: Current and desired well-being of pregnant women. Comparing the difference between the present and desired pregnancy feelings, it was revealed that most of the examined women would like to reduce the fear of giving birth (49.7 points) anxiety (37.2 points), and fatigue (25.3 points). Women would like to increase self-confidence (31.4 grades) and readiness for active actions during labor (23.3 points) (Figure 2). 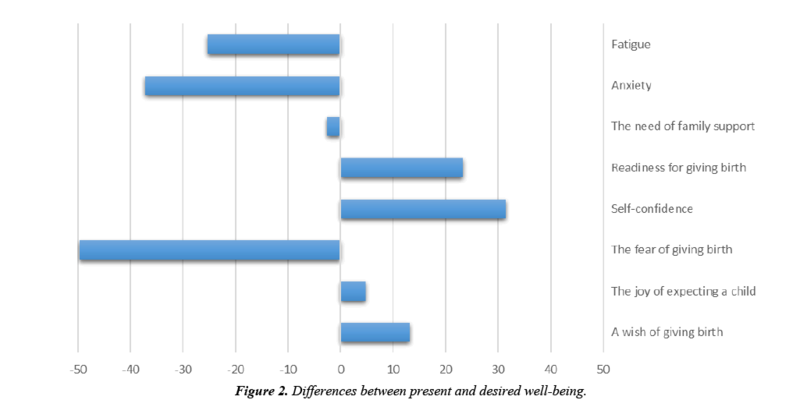 Figure 2: Differences between present and desired well-being. The possible relationship between pregnancy week and the present and desirable feel was investigated. The results showed that during the later weeks of pregnancy women feel more ready for active actions during labor (0.503, p<0.001) and at the same time strongly desire to be even more prepared for labor (r=0.752, p<0.001). Towards the end of a pregnancy the sense of anxiety (r=0.634, p<0.001) as well as the desire of having a baby increases (r=0.370, p<0.05), moreover, women are more willing to experience childbirth (r=0.383, p<0.05). Present and desired emotional state was compared between primiparous and multiparous women. The results revealed a statistically significant difference between their current emotional states: tiredness, readiness for active actions during labor, fear of giving birth and the joy of expecting a child. Primiparous women experience less fatigue, greater joy of expecting a child, but at the same time they are more afraid of giving birth (Table 1). Table 1. Differences of present well-being among women pregnant for the first or second time. There are statistically significant differences between primiparous and multiparous women regarding desired emotional state: self-confidence, preparation for active actions during labor, joy of expecting a child, anxiety and fear of giving birth. Women, who do not have previous experience of giving birth desire stronger preparation for labor, want to feel more confident and experience greater joy of expecting a child as compared to multiparous pregnant women (Table 2). Table 2. Differences of desired well-being among women pregnant for the first or second time. Differences between primiparous and multiparous women experiences is shown in Table 3. Women who are pregnant for the second time desire to reduce fatigue, seek greater emotional support from family members and experience greater joy of expecting a child than nulliparous women. Meanwhile nulliparous women want to minimize perceived fears of giving birth (Table 3). Table 3. Discrepancies between present and desired well-being among women pregnant for the first or second time. The study revealed that there is a need of programs to help pregnant women emotionally prepare for giving birth. All pregnant women, regardless of the duration of pregnancy and previous labor experience suffer from strong fear and anxiety. As a consequence pregnant women show only moderate desire (48.4 points) to undergo natural labor. Pregnancy is a very important time of a woman’s life. It can be seen as a critical situation that promotes personal development, but at the same time can lead to an identity crisis and internal conflicts. No less important event is the labor itself. Recently, the psychological preparation for motherhood is becoming increasingly investigated. Women's fear of giving birth and the length of the pregnancy may negatively affect women`s mental state and also negatively affect the development of the fetus. Therefore, attention must be given not only to women`s physical preparation for childbirth but also to psychological preparation. All signs that indicate difficult woman’s adaptation to pregnancy and childbirth (i.e., anxiety, fears) should be a major concern for mental health professionals . Postpartum mood disorders prevention should begin during pregnancy and should be focused on the psychological and social sources of support, matrimonial relationship building, mature coping strategies and stress and anxiety reduction techniques training. Also it is especially important for the woman to understand that one is going to become a mother and therefore begin preparation for motherhood. It is important to understand what could be the reasons of poor preparation for motherhood and anxiety causes, e.g. previous negative experiences during pregnancy or labor, lack of maternity experience, poor relations with the closest people, previously experienced stressful events, unplanned or poorly desired pregnancy. We started antenatal preparation for childbirth and motherhood program, which seeks to promote positive women's emotional state during pregnancy and the early postpartum period, i.e., to reduce anxiety and psychological causes of fatigue, to deal with pregnancy-related emotional problems. The program is designed to enhance the physical and psychological preparation for pregnancy and childbirth. It is believed that training will help to reduce fears of giving birth and promote positive mental attitude towards giving birth and child upbringing. The positive feedback from staff and women who have already completed the course indicates that such program is necessary. The main drawback of the present study is the small amount of study participants. What is more, participant’s social and marital status was not assessed. On the other hand, this study may be considered as a pilot study, revealing the immense significance of the current topic and the need for further researches. It is known that women’s perceived stress during pregnancy has a significant impact on fetal well-being. The next scientific milestone regarding current topic would be to distinguish objective physical and psychological impact on new-borns possibly related to stress perceived by pregnant mother. Our clinic is the first clinic in Lithuania to introduce a program with the purpose of monitoring pregnant women's psychological state and helping women psychologically prepare for pregnancy. Our program differs from others because we not only introduce pregnant women to the process of labor and the active actions one is supposed to do during labor, but we try to evaluate psychological state of a pregnant women and if any help is needed - provide it. However, to this date we have not accumulated a lot of experience, as specific psychological knowledge and training is lacking. Our other aim is to introduce psychologists to the current situation and to train them to address the issue in the correct manner. In our opinion pregnant women’s psychological state and the possibility to get psychological help when needed is of essential importance seeking best pregnancy outcomes. • Most pregnant women desire to reduce the fear of giving birth and anxiety, as well as to increase self-confidence and readiness for active operations during childbirth. • Most women are in need of psychological assistance especially when they are expecting their first child and during later pregnancy weeks. • Pre - motherhood classes can improve women’s wellbeing. It is likely that pregnant women’s proper psychological preparation would reduce fears related to giving birth naturally and therefore would reduce the number of women requesting caesarean section operation. Alder J, Fink N, Bitzer J, et al. Depression and anxiety during pregnancy: a risk factor for obstetric, fetal and neonatal outcome? A critical review of the literature. J Matern Fetal Neonatal Med. 2007;20(3):189-209. Araki M, Nishitani S, Ushimaru K, et al. Fetal response to induced maternal emotions. J Physiol Sci. 2010;60:213-20. Urech C, Fink NS, Hoesli I, et al. Effects of relaxation on psychobiological wellbeing during pregnancy: a randomized controlled trail. Psychoneuroendocrinology. 2010;35(9):1348-55. Giurgescu C, Penckofer S, Maurer MC, et al. Impact of uncertainty, social support, and prenatal coping on the psychological well-being of high-risk pregnant women. Nurs Res. 2006;55(5):356-65. Liou SR, Wang P, Cheng CY. Effects of prenatal maternal mental distress on birth outcomes. Women Birth. 2016;29(4):376-80. Liou SR, Wang P, Cheng CY. Longitudinal study of perinatal maternal stress, depressive symptoms and anxiety. Midwifery. 2014;30(6):795-801. Abeysena C, Jayawardana P, Seneviratne RA. Effects of psychosocial stress on maternal complications during pregnancy: a cohort study. Int J Collab Res Intern Med Public Health. 2010;2(12):436-48. Diego MA, Jones NA, Field T, et al. Maternal psychological distress, prenatal cortisol, and fetal weight. Psychosom Med. 2006;68:747-53. Gilynn LM, Schetter CD, Hobel CJ, et al. Pattern of perceived stress and anxiety in pregnancy predicts preterm birth. Health Psychol. 2008;27(1):43-51. Field T, Diego M, Hernandez-Reif M. Prenatal depression effects on the fetus and newborn: a review. Infant Behav Dev. 2006;29:445-55. Hernandez-Valencia M, Rivera Montes AM, Vargas Lopez C, et al. Catecholamines level variation during pregnancy in women with diabetes and preeclampsia. Gynecol Obstet Mex. 2007;75:454-8. Rosand GB, Slinning K, Eberhard-Gran M, et al. Partner relationship satisfaction and maternal emotional distress in early pregnancy. BMC Public Health. 2011;11:161-73. Seimyr L, Sjogren B, Welles-Nystrom B, et al. Antenatal maternal depressive mood and parental-fetal attachment at the end of pregnancy. Arch Womens Ment Health. 2009;12(5):269. Eberhard-Gran M, Tambs K, Opjordsmoen S, et al. Depression during pregnancy and after delivery: A repeated measurement study. J Psychosom Obstet Gynaecol. 2004;25:15-21. Staneva A, Bogossian F, Pritchard M, et al. The effects of maternal depression, anxiety, and perceived stress during pregnancy on preterm birth: A systematic review. Women Birth. 2015;28(3):179-93. Talge NM, Neal C, Glover V. Antenatal maternal stress and long-term effects on child neurodevelopment: how and why? J Child Psychol Psychiatry. 2007;48:245-61. Littleton HL, Breitkopf CR, Berenson AB. Correlates of anxiety symptoms during pregnancy and associations with perinatal outcomes: A meta-analysis. Am J Obstet Gynecol. 2007;196(5):424-32. Hart R, McMahon CA. Mood state and psychological adjustment to pregnancy. Arch Womens Ment Health. 2006;9:329-37. Winkel S, Einsle F, Pieper L, et al. Associations of anxiety disorders, depressive disorders and body weight with hypertension during pregnancy. Arch Womens Ment Health. 2015;18(3):473-83. Hall WA, Hauck YL, Carty EM, et al. Childbirth fear, anxiety, fatigue, and sleep deprivation in pregnant women. J Obstet Gynecol Neonatal Nurs. 2009;38:567-76.